Tired of looking out the back door to that blank yard? 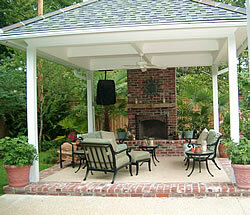 Want to incorporate an outdoor area that is useful and enjoyable? Try to think of your yard as potential outdoor living spaces complete with flooring, walls and sometime a ceiling, just like your home. An outdoor living area can be a place where you may sit and enjoy the sights and sound of nature or walk through the landscape space and enjoy the experience of your own garden. Some people create elaborate kitchen areas, with cabanas and bars or swimming pool and spas areas. Others ideas of an outdoor space can be as simple as a grassy area with a table and chairs, either way, the choice is totally up to what you desire to see in your outdoor garden space. Your front or backyard is an extension to your home, a series of potential spaces where outdoor rooms can provide additional living spaces for you, your guests and your family to enjoy. These outdoor living spaces are shaped by the use of landscaping plant materials and hard-scape materials fashioned to be floors, walls or ceilings just as in a home or building. Also, just as in your home or office, the rooms are connected with hallways or pathway areas, outdoor spaces are connected with walks or pathways to get to the outdoor living areas. Careful placement of these outdoor rooms and their connecting paths can produce an exciting and dynamic garden space with a variety of outdoor rooms and connecting walks to use and experience in the serenity of nature. Incorporated thoughtfully into the natural surroundings, these garden rooms can make a relaxing retreat for your family and friends that will give enjoyment for a lifetime and add value to your property. By designing a sequence of spaces that people can move from one area to another creates an interesting series of outdoor rooms. Placement of some outdoor living areas is easy and self evident, such as placing a patio area directly adjacent to the back door entrance to your home or office. Others may take more planning and design considerations to layout the spaces in a logical sequence, but taking this time to consider what and where the areas should be located on the property, will produce a pleasing functional garden landscape. Also, having a balance between small closed-in spaces and the larger open spaces is one of the secrets to great landscape garden design. You should try to accommodate all of the activities you will be using the areas for which may include outdoor sports areas, barbeque areas, sitting areas, garage and storage areas, pools and spa areas, etc. If your outdoor living areas are elaborate or if you want to make to most of a budget, you should consider using a professional designer or landscape architect who will walk you through the design process and can produce designs that are well thought out and work within your budget. Flooring for your outdoor living space can be as accomplished with the use of something as simple as grass or as elaborate as a natural stone finish to a patio or walk. It can be any material you choose and can take on the size and shape you would like or what your property can accommodate. Outdoor living area walls can be incorporated into the spaces with the use of plant materials planted in close rows or patterns to produce a hedge effect or an outdoor wall can be achieved by installing fencing or masonry walls to add an enclosure to your outdoor living space. The height of a these wall can give a sense of enclosure to an area and can really add to the dramatic effect of an outdoor room. Making a low wall of 4 feet or less can give a less ‘closed off’ sense to an area while a taller 5 or more feet height to a wall can give a more private feeling to a space. Ceilings in outdoor spaces can be a accomplished with a permanent structure such as a patio covering, or a softer more open effect in a material such as an open wooden arbor or the branching pattern of a tree canopy. Sometimes it is nice to just see the blue sky or the stars at night as the ceiling to your outdoor living area. Each of these examples gives a varying degree of enclosure as a ceiling for your outdoor living area and depends on the effect you wish to convey. The final design of these outdoor spaces is limited only by budget and your imagination and is well worth the time to invest thinking through the best solution for your garden landscape and your outdoor living areas. Even if you can only install a portion of the outdoor living area, over time you can add to this start and eventually complete your outdoor garden living areas to enjoy for years to come.